John McCain Wins. But the Tea Party Didn't Lose. Four years ago, McCain also told students he supported repeal of the “don’t ask, don’t tell” policy that bans gays from serving openly in the military. But in May, the former war hero and Navy prisoner of war promised to filibuster any bill including that change that landed on the Senate floor. He sidestepped the climate change debate this year despite once being a Senate leader on the issue and he’s even distanced himself from the term that once seemed central to his political brand—his “maverick” trademark. Hayworth, the primary election opponent McCain has spent a small fortune pummeling as inept, corrupt and even stupid, has seized on the apparent contradictions. McCain’s defenders would probably argue that he’s never been anything other than a “Goldwater conservative,” as he likes to call himself, and on some issues, that may be true. 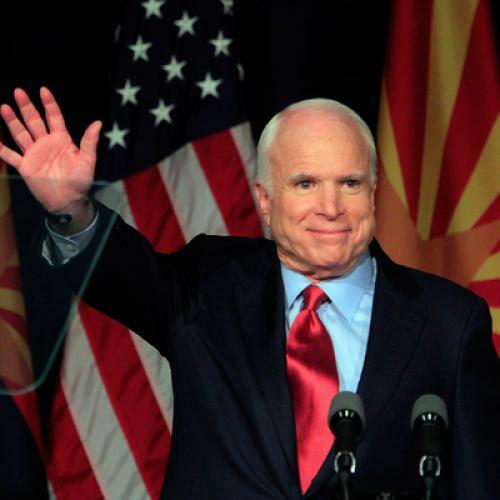 But there is no way to deny that the John McCain who gave the conservative movement a near-death experience in 2000 and then trod a genuine maverick path until at least 2004 is virtually unrecognizable in the senior senator from Arizona today. Still, Catanese is off the mark in attributing this devolution to McCain’s battle against Hayworth. McCain has been moving rightward pretty steadily since at least the moment he decided to run for president again in the 2008 cycle. And in this metamorphosis, he has accurately reflected trends in his party. Many observers, particularly liberals, have been shocked by the dramatic rightward march of the GOP since November 2008, with all its thundering against Barack Obama’s “socialism” and its outstretched hand to the virulently anti-government Tea Party movement (which is largely composed of faithful Republican voters). It’s not often, after all, that a political party reacts to two consecutive electoral calamities by moving further away from the political center. Disaffection over spending and immigration have caused conservatives to take flight from President Bush and the Republican Congress at a rapid pace in recent weeks, sending Bush's approval ratings to record lows and presenting a new threat to the GOP's 12-year reign on Capitol Hill, according to White House officials, lawmakers and new polling data. Bush and Congress have suffered a decline in support from almost every part of the conservative coalition over the past year, a trend that has accelerated with alarming implications for Bush's governing strategy. The Gallup polling organization recorded a 13-percentage-point drop in Republican support for Bush in the past couple of weeks. These usually reliable voters are telling pollsters and lawmakers they are fed up with what they see as out-of-control spending by Washington and, more generally, an abandonment of core conservative principles…. "The problem in my mind, and the only way to explain the very significant erosion is just a disgust with what appears to be a complete abandonment of limited government," said former Republican congressman Pat Toomey, who runs the conservative Club for Growth. Toomey said commitment to smaller government has been the unifying idea for most elements of the GOP coalition since Ronald Reagan's presidency. "Republicans have finally had enough," he said, a sentiment echoed by several other conservative activists and lawmakers. There was a temporary renewal of conservative support for Bush after the 2006 elections, mainly attributable to his decision to defy the electorate with a “surge” in Iraq (a policy heavily identified with John McCain, to his own benefit among conservatives). But in general, on the right, the belief only intensified that Bush had betrayed the cause by accepting and even advocating higher domestic spending. He had championed a larger federal role in education and health care (with his Medicare prescription drug benefit), while also engaging in a maddening effort to buy Hispanic votes with “amnesty” for illegal immigrants. All of these initiatives, of course, were part and parcel of Karl Rove’s efforts to build a Republican majority by placating the conservative base while strategically reaching out to key categories of swing voters. To conservatives, it looked like the swing-voter tail was wagging the conservative dog. It was during the general election, however, that the tension between McCain’s need for swing votes and ever-increasing pressure from conservatives to turn right reached its peak .In that context, his choice of Sarah Palin as a running mate made perfect sense: She was “mavericky” all right—as it would soon be phrased—yet she was also not only acceptable, but downright exciting to hard-core conservatives, particularly the right-to-life movement that essentially scuttled McCain’s hopes of picking Joe Lieberman. Then, during the campaign, when you might have expected McCain to take his conservative votes for granted while lusting after moderate independents, he instead turned even more noticeably to the right, framing his message around Joe the Plumber, attacking Obama’s tax proposals as an attempt to “spread the wealth,” and even dabbling in the ACORN conspiracy theory of the housing meltdown that was popular on the right-wing talk show circuit. Even that wasn’t enough red meat for conservatives, who at one point started shouting at McCain at his own rallies, demanding more talk about Obama’s “radical” associations and socialistic policy proposals. Indeed, in every important respect, these were the birth pangs of the Tea Party movement. That movement obtained a distinct identity in early 2009, but it was fundamentally a cadre of conservative activists who had been radicalized during the traumatic experience of the 2008 campaign and its unhappy result. To conservatives, of course, it was no mere coincidence that even as McCain and Palin were going down to defeat, the Bush administration and its congressional allies were executing one final betrayal of the cause by proposing and helping to enact TARP and other “bailouts.” This sealed the GOP ticket’s fate, but just as importantly, rid conservatives of any sense of responsibility, political or moral, for Bush’s sins. With the inauguration of Barack Obama, conservatives were also freed from any responsibility to govern the country, and soon embarked on a two-front war against the new “socialist” administration and the “RINOs” who enabled it.